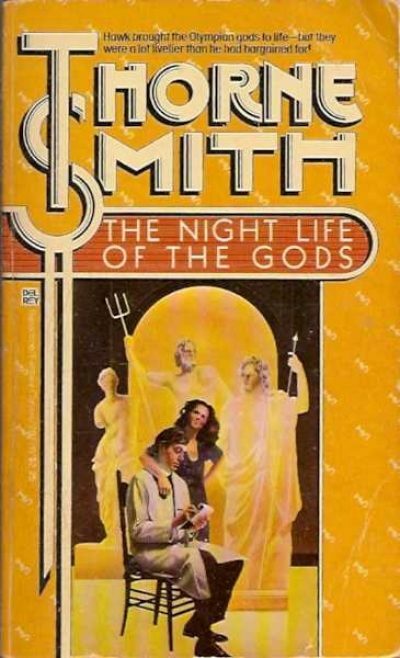 I owe my encounter with 1931’s The Night Life of the Gods to Del Rey’s decision to reprint six of Thorne Smith’s comic fantasies ( Topper, Topper Takes a Trip , The Night Life of the Gods , The Stray Lamb , Rain in the Doorway , and Turnabout) in 1980. I had never heard of Thorne Smith—then—although once I had read a few of his novels, I realized that I had already encountered many of his characters and plots in movies and TV. Sometimes directly adapted from his work, sometimes inspired by it 1. Of the six reprints, Rain in the Doorway was my favourite, but The Night Life of the Gods had a quality even Rain could not match: Night Life was my very first Thorne Smith novel. As I would learn, Smith novels tend to have very recognizable themes: unhappy middle-aged men, often married, trapped in unrewarding lives, who are freed from the doldrums of modern existence by an encounter with the whimsically fantastic, which often comes in the form of a fetching young woman. Although I couldn’t know it at the time, this being my first Smith, Night Life subverts the Smith formula. Protagonist Hunter Hawk isn’t one of Smith’s worn-down conformists. Hunter Hawk, you see, does not give a fig for convention because Hunter Hawk is a Mad Scientist! His relatives, on the other hand, are for the most part a bunch of feckless losers, who have no shame when it comes to taking advantage of the wealthy bachelor’s generosity. Having ensconced themselves in Hawk’s home, the Lamberts are reluctant to leave. They are kind enough to offer him no end of constructive criticism while they await Hawk’s inevitable demise in a laboratory explosion, which (should all go as it should) will end in their inheritance of his home and fortune. The one Lambert worthy of Hawk’s largess is Hawk’s niece Daffy, who could well be someone’s Manic Pixie Dream Girl some day 2. Not Hawk’s, though, because this isn’t a Robert Heinlein novel. To the disappointment of (most of) the Lamberts, Hawk not only survives the latest and greatest of his laboratory explosions, he succeeds “in achieving complete cellular petrification through atomic disintegration.” Which in simpler terms means that he is now master of a process that can turn living matter to stone and back again. That invention alone would be enough to ensure wacky hijinks—almost his first use of his new invention is to turn his leeching relatives into silent, disapproving statues—but an act of charity leads to a meet-cute with Magaera, a 900-year-old Little Person 3 still in the bloom of young womanhood. The pair are immediately smitten with each other. Magaera isn’t just a wild-spirited attractive woman: she wields her people’s magic and among her spells is one as complimentary to Hawk’s invention as she is to Hawk. Magaera knows how to turn unliving stone into living flesh. And what better test for Magaera’s spell than the statues of the Roman gods in the Metropolitan Museum of Art? Who, made living flesh, become avatars of those very gods. Despite the reliable Del Rey colophon on the spine, I might not have tried the Thorne Smith novels if it had not been for Baird Searles’ review in the July 1980 Asimov’s. Who says reviews don’t have power to improve readers’ lives? Bad people, that’s who. In his heyday, Smith was pretty well known. By the 1970s, he was close to forgotten; these days he does not even have a TV Tropes entry (of course, neither do I and I am certainly not bitter about that). I think part of the reason for his fall from popular favour is that recurring comic elements in his books have not aged well. For example, hilarious drunk driving is a significant element in most of the books 4. For another, POC don’t often appear in Smith books and when they do, it is unfortunate. What you will reliably find in any Smith novel are drinking, wacky adventures, drinking, as much racy material as the censors would allow 5, drinking, a general rejection of the rules of polite society, drinking, good odds of a court room scene featuring an increasingly exasperated judge (sadly, I think it is a different judge in each novel). And drinking. Night Life of the Gods is no exception. That said, the book does break from Smith’s standard model in some respects. Hawk doesn’t need a Manic Pixie Dream Girl to inspire a rejection of conformity; he rejected conformity years ago, if indeed he had ever accepted it. What Magaera offers him is not inspiration but a kindred spirit 6. Hawk and Magaera do find an escape clause, but their final victory is at best bittersweet. Although the frequency of Thorne Smith reprints dropped off after 1980, some readers may live in regions where Thorne Smith’s books are in the public domain. Those not so fortunate may be grateful that we live in a golden age of ebooks. At least one recent edition of The Night Life of the Gods can be found here. 1: I have seen a couple of episodes of the old Topper TV show and the Disco-era TV adaptation of Turnabout. I’ve even watched Bewitched, which, while not based on any particular Smith work, counts Smith’s The Passionate Witch in its lineage. Oh, and if Wikipedia can be believed, Star Trek’ s execrable final episode, Turnabout Intruder, was based on Turnabout. All the worse elements, badly done. There was a movie version of The Night Life of the Gods . I have not seen it myself, but given the risqué banter in the book, I would bet that the movie is a very, very toned-down version of the book. 2: Daffy would likely object to the implication in my wording that she would be someone’s girl, as opposed to the man being her fellow. If you see what I mean. 3: But not too Little. The book takes time to address that issue. 4: Admittedly, it was driving drunk at high speeds that got Marion and George Kirby killed in Topper, but death was less inconvenient for them than you might expect. (…) taking the girl in his arms and slipping off her drapery as they sank to the cold stone floor. And Meg took the man to her as a woman takes a man. I don’t know if “as a woman takes a man” was sufficient to get this novel banned in Boston, but another Smith work, Dreams End, was, in fact, Banned in Boston. 6: Admittedly Daffy is a kindred spirit, but she is not a possible romantic partner for Hawk, because this is still not a Heinlein novel.